Alloying with vanadium has meant that advantageous properties such as tensile strength and yield stress can be achieved through air cooling of the material. In automobiles and many other engineering machines, large quantities of components are made from forging steels. These parts are traditionally hot forged into their rough shapes and then quenched and tempered (Q+T) to obtain desirable mechanical properties. Common applications include a variety of engine, transmission, suspension, and driveline components such as gears, springs, crankshafts, connecting rods, axles, spindles, etc. In most cases, these applications use microalloy precipitation for strengthening and/or grain refinement. The fundamentals of the precipitation and/or grain refinement are reviewed briefly. Differences encountered among the various applications stem from their different service requirements, which drive the use of different steel compositions and base microstructures (ferrite, pearlite, bainite, or martensite). Traditional medium carbon forging steels achieve their strength and toughness in additional separate processes of quenching and tempering after forging. In order to reduce production costs and avoid usual problems associated with quenching, especially long products, vanadium microalloyed forging steels had been developed. These steels achieve required level of strength during air cooling directly from hot forging temperature, due to V(C, N) precipitation in ferrite. However, the toughness of the air cooled steels is lower, because coarsening of austenite grains at temperatures used in conventional forgings produces coarse ferrite-pearlite structure. Microalloying with titanium provided austenite grain refinement by Zener pinning effect of highly insoluble TiN particles. Fine ferrite-pearlite structures with improved toughness had been achieved. On the other hand, coarse TiN particles, usually larger than 1 µm, act as fracture nucleation sites and are detrimental to the toughness of the steel. 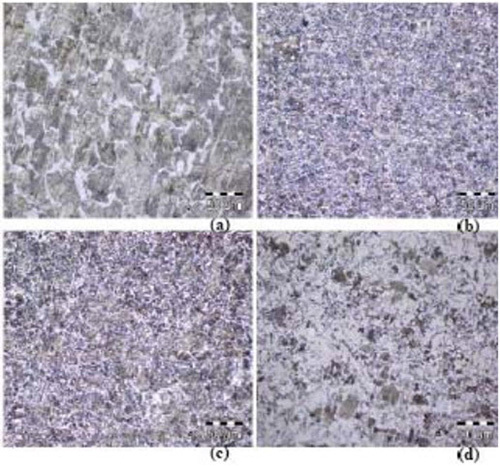 The authors M.I.Equbal, R.K.Ohdar, B.Singh, P.Talukdar have studied the applicability of medium carbon vanadium micro-alloyed steel in hot forging. Forgeability has been determined with respect to different cooling rates, after forging in a hydraulic press at 50% diameter reduction in temperature range of 900-1100°C. Data shown in Table 1 for ultimate tensile strength (UTS), yield strength (YS), percentage elongation (%EI), hardness (HV) and Charpy V- notch impact strength (CVN I.S.) with respect to different forging temperatures can be compared for normal air cool (NMA), forced air cool (FMA) and oil quenched (QMA) micro-alloyed steel. Table 1: Mechanical properties of 38MnVS6 micro-alloyed forged samplesOn the other hand, the evaluations of the microstructure for 38MnVS6 microalloyed forged steel under various above mentioned cooling conditions are shown in Figure 1. Micro structural analysis indicates that NMA and FMA consist of ferrite-pearlite structure but QMA additionally contains some amount of bainite, alloyed cementite, vanadium carbides or carbo-nitrides. It has been observed that fine vanadium carbides or carbo-nitrides are distributed throughout the matrix of NMA, FMA and QMA steels. The yield strength, tensile strength and hardness have increased with increase of cooling rates. The elongation and impact strength tends to improve at slower cooling rates such as air cooling. However increasing the cooling rate has a negative effect on elongation. Tensile strength and Impact strength increases due to the presence of uniformly fine carbides or nitrides in the matrix of uniformly distributed fine grain structure. Hardness increases due to presence of redistribution of alloyed cementite and distribution of fine vanadium carbides or carbo-nitrides.